MEDIUM 14.5 x 20.75 in. (367 x 527 mm) 18 x 24 in. LARGE 20.75 x 29.75 in. (527 x 755 mm) 24 x 34.5 in. The practice tradition of the Thirty-five Buddhas of Confession (Tib. Tung-sha) is based upon a Mahayana text known as the ‘Sutra of Three Heaps’ (Skt. Triskandha-sutra), which is performed by the Buddhist sangha in order to absolve any transgressions against their religious vows. This three-part practice involves: praises to the Buddhas, confession, and dedication of merit. There are several different traditions of depicting the Thirty-five Buddhas, with their varying colours, gestures, and their few individual hand attributes. This thangka was painted by Dorje Tamang and is identical to that of the Tibeto-Mongolian pantheon of woodblock-prints known as the ‘Three Hundred Icons’, which was compiled in Beijing by Changkya Rolpai Dorje (1717-86). The sequence in this composition begins with (1) Shakyamuni Buddha, who sits upon his enlightenment and lion-throne at the centre, while being flanked by his two main disciples, Sariputra (left) and Maudgalyayana (right). The blue Buddha to the left of Sariputra is the second of the Buddhas (2), and then the sequence circles clockwise around Shakyamuni’s throne to the white Buddha (12) to the right of Maudgalyayana. The next nine Buddhas (13-21) circle clockwise outside the first circle of Buddhas (2 -12), with (17) being at the top. The last fourteen Buddhas are arranged from left to right amidst the offerings in the three horizontal rows at the bottom: (22-26) upper row, (27-31) middle row, and (32-35) lower row. At the top centre is blue Vajradhara, who is flanked by Vajrasattva and White Tara to his left and right. And at the bottom centre is the yellow lion-mounted wealth god, Vaishravana. 1. Shakyamuni (Tib. Shakya thub-pa), the ‘Sage of the Shakyas’ is the historical Buddha and the first of the Thirty-five Buddhas. He is golden-yellow in colour, his right hand makes the earth-touching gesture, and his left hand rests upon his lap in the dhyana-mudra of meditative equipoise as he supports his blue alms-bowl. 2. Vajragarbha-pramardin (Tib. rDo-rje snying-po rab-tu ‘joms-pa), the ‘Vajra Essence Conqueror’, who appears directly to the left of the Buddha’s lion-throne and Sariputra. He is dark blue in colour, and both of his hands are held before his heart with their palms facing outwards in the gesture of explaining the dharma. 3. Ratnarshis (Tib. Rin-chen ‘od-’phro), the ‘Jewel Radiating Light’. He is white in colour, and both of his hands rest upon his lap in the dhyana-mudra of meditative equipoise. 4. Nagesvara-raja (Tib. kLu-dbang-gi rgyal-po), the ‘Lordly King of the Nagas’. His body is dark blue up to the lower crease of his neck, his neck and face are white, and seven naga-serpents appear around his halo. Both of his hands are folded before his heart with their index fingers extended in a gesture known as ‘removing beings from places of birth in the miserable realms’. 5. Virasena (Tib. dPa’-bo’i-sde), the ‘Hero of Warriors’. His body colour is yellow, and both hands are held in the abhaya-mudra of protection, with his right hand at the level of his knee, and his left hand in front of his heart. 6. Viranandin (Tib. dPa’-bo dgyes), the ‘Joyful Hero’. His body is flesh coloured and both hands are held before his heart in the dharmachakra-mudra of teaching. 7. Ratnagni (Tib. Rin-chen-me), the ‘Jewel of Fire’, who appears directly above Shakyamuni’s throne. He is red in colour and is similar to Shakyamuni in appearance, with his right hand making the earth-touching gesture, and his left hand resting upon his lap in the dhyana-mudra of meditative equipoise. 8. Ratnacandraprabha (Tib. Rin-chen zla-’od), the ‘Jewel of Moonlight’. He is white in colour and is similar to Shakyamuni in appearance, with his right hand making the earth-touching gesture, and his left hand in the gesture of meditative equipoise. 9. Amoghadarsin (Tib. mT’on-ba don-yod), the ‘Meaningful to Behold’. He is dark green in colour, and his two hands rest upon his lap in the dhyana-mudra of meditative equipoise. 10. Ratnacandra (Tib. Rin-chen zla-ba), the ‘Jewel Moon’. He is pale green in colour, and both hands are held before his heart in the dharmachakra-mudra of teaching. 11. Vimala (Tib. Dri-ma med-pa), the ‘Stainless One’. He is grey in colour, and both hands rest upon his lap in the dhyana-mudra of meditative equipoise. 12. Shuradatta (Tib. dPal-sbyin), the ‘Courageous Giver’, who appears directly to the right of the Buddha’s lion-throne and Maudgalyayana. He is white in colour, and both hands are held before his heart in the teaching or dharmachakra-mudra. 13. Brahma (Tib. Tshangs-pa), the ‘Supremely Pure One’. His body is flesh coloured, and he is similar to Shakyamuni in appearance, with his right hand making the earth-touching gesture, and his left hand in the gesture of meditative equipoise. 14. Brahmadatta (Tib. Tshangs-pas sbyin), the ‘Giver of Purity’. He is yellow in colour, and both his hands are held before his heart in the dharmachakra-mudra of teaching. 15. Varuna (Tib. Chu-lha), the ‘Water Deity’. He is dark blue in colour, and he is similar to Shakyamuni in appearance, with his right hand making the earth-touching gesture, and his left hand in the gesture of meditative equipoise. 16. Varunadeva (Tib. Chu-lha’i-lha), the ‘God of all Water Deities’, who appears at the top left. He is white in colour, and with both hands held before his heart he makes the dharmachakra-mudra of teaching. 17. Bhadrashri (Tib. dPal-bzang), the ‘Gloriously Good’, who appears at the top centre of all the Thirty-five Buddhas. He is pale red in colour, and his right hand is extended palm-downwards to his knee in the abhaya-mudra of protection, while his left hand rests upon his lap in the dhyana-mudra of meditative equipoise. 18. Candanashri (Tib. Tsan-dan dpal), the ‘Glorious Sandalwood’, who appears at the top right. He is yellow in colour, and his right hand is held palm-outwards in the abhaya-mudra of protection, while his left hand rests upon his lap in the dhyana-mudra of meditative equipoise. 19. Anantaujas (Tib. gZi-brjid mtha’-yas), the ‘Infinite Splendor’. He is red in colour, and with both hands held before his heart he makes the gesture of explaining the dharma. 20. Prabhasashri (Tib. ‘Od-dpal), the ‘Glorious Light’. He is white in colour, and with both hands held before his heart he makes the gesture of explaining the dharma. 21. Ashokashri (Tib. Mya-ngan med-pa’i dpal), the ‘Glorious One Without Sorrow’. He is light blue in colour, and with both hands resting upon his lap in the dhyana-mudra of meditative equipoise he holds a piece of ‘lotus-jewel’ rock that represents the ‘Precious Lord of Mountains’. 22. Narayana (Tib. Sred-med-kyi bu), the ‘Son Without Desire’. 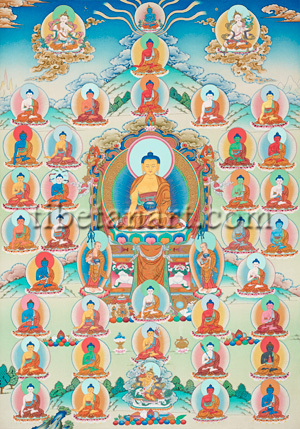 He appears at the top left of the third row from the bottom, with the remaining fourteen Buddhas appearing sequentially from left to right in these three lower rows. He is sky blue in colour, and with both hands held before his heart he makes the gesture of explaining the dharma. 23. Kusumashri (Tib. Me-tog dpal), the ‘Glorious Flower’. He is yellow in colour, and with both hands he makes the abhaya-mudra of protection, with his right hand extended palm-downwards at his knee, and his left hand held before his heart. 24. Brahmajyotis (Tib. Tshans-pa’i ‘od-zer), the ‘Radiantly Pure Light’, who appears directly below Shakyamuni’s throne at the centre. He is white in colour and is similar to Shakyamuni in appearance, with his right hand making the earth-touching gesture and his left hand resting upon his lap in meditative equipoise. 25. Padmajyotis (Tib. Pad-ma’i ‘od-zer), the ‘Radiant Lotus Light’. He is red in colour and is similar to Shakyamuni in appearance, with his right hand making the earth-touching gesture and his left hand resting upon his lap in meditative equipoise. 26. Dhanashri (Tib. Nor-dpal), the ‘Gloriously Abundant in Wealth’. He is pink in colour and appears at the top right of the third row from the bottom. With his right hand he makes the abhaya-mudra of protection in front of his heart, while his left hand rests upon his lap in meditative equipoise. 27. Smrtishri (Tib. Dran-pa’i-dpal), the ‘Gloriously Mindful’, who appears on the left of the second row from the bottom. He is yellow in colour, and is similar to Shakyamuni in appearance, with his right hand making the earth-touching gesture and his left hand resting upon his lap in meditative equipoise. 28. Suparikirtita-namadheyashri (Tib. mTshan-dpal shin-tu yongs-grags-pa), the ‘Illustrious and Gloriously Named’, who is green in colour. With his right hand he makes the abhaya-mudra of protection in front of his heart, and his left hand rests upon his lap in meditative equipoise. 29. Indraketu-dhvaja (Tib. dBan-po’i tog-gi rgyal-mtshan), the ‘Mighty Holder of the Victory Banner’. He is yellow in colour, and his left hand rests upon his lap in dhyana-mudra. With his right hand he makes the abhaya-mudra of protection in front of his heart as he holds the shaft of his attribute, a silk victory-banner. 30. Suvikranta (Tib. Shin-tu rnam-par gnon-pa), the ‘Victorious Subjugator’. He is white in colour, and his left hand rests upon his lap in dhyana-mudra. With his right hand he makes the abhaya-mudra of protection in front of his heart as he holds the vajra-handle of his attribute, a blazing iron sword. 31. Vijita-samgrama (Tib. gYul-las sin-tu rnam-pa rgyal-ba), the ‘Victorious in Battle’. He is black in colour, and appears at the right of the second row from the bottom. With both hands in front of his heart he holds the attribute of a piece of armor. 32. Vikranta-gamin (Tib. rNam-par gnon-pa’i gsegs), the ‘Victorious Subjugator’. He is white in colour, and appears in the bottom left corner. He is similar to Shakyamuni in appearance, with his right hand making the earth-touching gesture and his left hand resting upon his lap in dhyana-mudra. 33. Samantavabhasa-vyuha (Tib. Kun-nas snang-ba bkod-pa), the ‘Eternally Illuminating One’, who is yellow in colour. He makes the abhaya-mudra of protection with both hands, his right hand extended palm-downwards and his left hand held in front of his heart. 34. Ratnapadma-vikramin (Tib. Rin-chen pad-ma’i rnam-par gnon-pa), the ‘Victorious Lotus Jewel’. He is red in colour, and both of his hands rest upon his lap in the dhyana-mudra of meditative equipoise. 35. Sailendra-raja (Tib. Ri-dbang-gi rgyal-po), the ‘King of the Lord of Mountains’, who appears in the bottom right corner. He is dark blue in colour, and with his right hand he makes the abhaya-mudra of protection in front of his heart, while his left hand rests upon his lap supporting a blue alms-bowl.